[ The first translation into Welsh of Bacon's 'Essays'. ] Traethodau Gwladol A Moesol. Gan Francis Bacon, Barwn Verulam, Is-Iarll St. Alban, Ac Arglwydd Uchel Ganghellydd Lloegr. Gyda Hanes Bywyd Yr Awdwr A Nodiadau, Gan Richard Williams, Trallwm. The first translation into Welsh of Bacon's 'Essays'. 160pp., 12mo. Disbound pamphlet without wraps. Title-leaf loose, otherwise in fair condition, on lightly aged paper. The volume contains the fifty-eight essays, the fragment of an essay 'Of Fame' and 'The Praise of Knowledge', together with the biography and notes by Richard Williams of Welshpool. No copy in the National Library of Wales, and the only copy on COPAC at the British Library, whose entry tentatively dates the work to the year 1870. Now extremely scarce. [xiv], 207pp., dark green cloth, corners bumped, mainly good to very good. A copy inscribed by Matthew Arnold to Lady Dorothy Neville, 'writer, hostess, horticulturist and plant collector', with a letter by Arnold concerning his gift of the book tipped in. Also with prined "From the Author" note enclosed (loose), a printed bookplate alleging "Stolen from Lady Dorothy Neville", and a newspaper clipping concerning Matthew Arnold's burial place tipped in. The letter from Arnold reads as follows: "Dear Lady Dorothy | The Fourth Party are excellent company, but Sunday is impossible for me. Autograph Letter Signed ('J. Madden') from James Madden, of London publishers Madden & Malcolm, informing the unnamed recipient that his paper on 'Cycles of Civilization' will be published in firm's periodical 'The Monthly Prize Essays'. Addressed from Madden's home address of 23 Artillery Place, City Road, London, with the business address of Madden and Malcolm (8 Leadenhall Street) scored through. 4 June 1846. 2pp., 12mo. Bifolium. 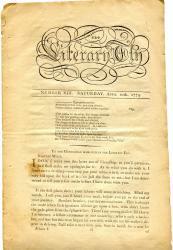 In fair condition, on aged paper with wear to corners. The context of the letter is apparent from the following advertisement in The Times, 29 June 1846: 'On the 30th of June, will be published, in 8vo., price 2s. 6d., the first number of | THE MONTHLY PRIZE ESSAYS. Each number will contain six Essays in Prose and six in Verse. The first prize for prose will be £20; the second, £15; the third, £10; and the other three, £5 each. There will be but three prizes for poetry - £5, £3, and £2. The Essays must be delivered by the 30th of the previous month. Autograph Letter Signed to unnamed male correspondent [Mr Blunt of Crewe]. 29 May 1859; 'Edinburgh 23 Rutland St'. Scottish essayist (1810-82). Two pages, 12mo. With mourning border. Good, but on discoloured paper, and with some glue staining to blank second leaf of bifoliate. Concerns the work for which Brown is remembered, 'Rab and his friends' (1859). If he is ever at Crewe he will 'certainly avail myself of Mrs. Blunt's & your very gratifying invitation. His wife is 'more delighted, I think, with your letter about "Rab" than by any other - & she has kept it - being like all good wives greedy of her husband's praise.' Signed 'J. Brown'. Two issues of 'The Literary Fly'. Number 13: 10 April 1779. Number 14: 17 April 1779. 'Printed and Published by Etherington, at No 25, opposite the South Door of St. Paul's'. Both issues 8vo (roughly 30.5 x 19.5 cm), 6 pp (each a loose leaf in a bifolium). Both printed on brittle watermarked laid paper. 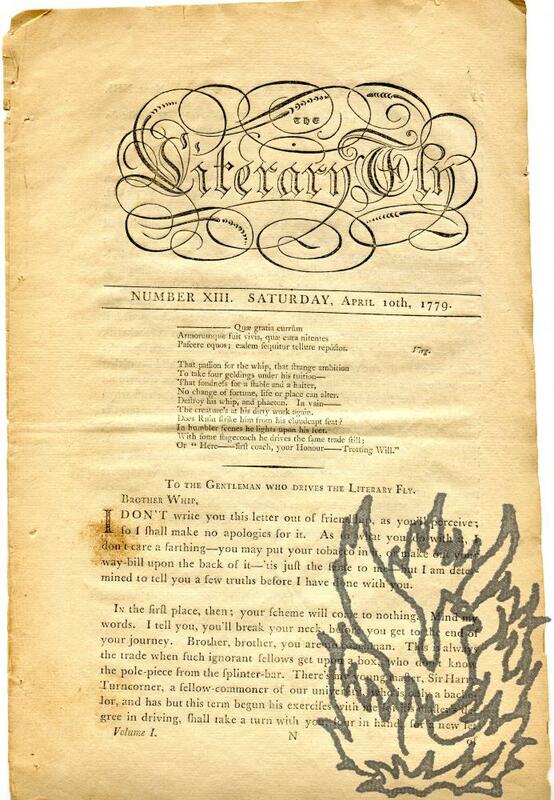 Both unbound, and stabbed as issued, and both on aged and chipped paper, but with the text clear and entire. Each issue with the title in an expansive calligraphic design. The full slug, at the bottom of the last page of both issues, reads: 'Printed and Published by ETHERINGTON, at No 25, opposite the South Door of St. Paul's (where Letters, post-paid, to the LITERARY FLY will be received). Johnsonian studies including a bibliography of Johnsonian studies, 1950-1960 compiled by James L. Clifford & Donald J. Greene. 351 pages, 8vo. Unbound: in original brown printed wraps. In good condition, but with wraps browning and creased. Ownership inscription on inside of front wrap. An important collection, with the bibliography accompanied by seventeen essays, including ones by J. D. Fleeman, Arthur Sherbo, Joyce Hemlow and Gwin J. Kolb. Autograph Note Signed to R. S. McMinn. 41 Sloane St; no date, but postmarked 21 Sept 1920. English essayist and biographer (1868-1938). Plain postcard, dimensions roughly 4 1/2 inches by 3 1/2 inches. Grubby and smudged, with central vertical crease. Deleted printed letterhead '176, VICTORIA STREET, | (CORNER OF BUCKINGHAM PALACE ROAD.) | S.W.1.' Reads '41 Sloane St | Many thanks | E. V. Lucas'. Addressed by Lucas to 'R. S. McMinn Esq | 35 Birdhurst Rd | S. Croydon'. Signed uncashed bank cheque payable to J. H. Thorpe. Barclays Bank Limited | 366, STRAND, W.C.2. '; 12 July 1927. English essayist and biographer of Charles Lamb (1868-1938). 1 page, dimensions approximately 4 inches by 6 inches. Somewhat grubby and creased. Reads 'Feb 26| 1919 | with E V Lucas's | compliments'.